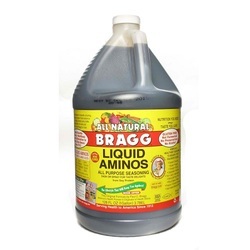 Bragg Liquid Aminos is a Certified NON-GMO liquid protein concentrate, derived from healthy soybeans, that contains the following Essential and Non-essential Amino Acids in naturally occurring amounts:16 Amino AcidsAlanineArginineAspartic AcidGlutamic AcidGlycineHistidineIsoleucineLeucineMethioninePhenylalanineProlineSerineThreonineTyrosineValineLysine Great on Salads & Dressings, Soups, Veggies, Rice & Beans, Tofu, Wok & Stir-frys, Tempeh, Casseroles, Potatoes, Meats, Poultry, Fish, Jerky, Popcorn, Gravies & Sauces, Macrobiotics.Ingredients: Our Bragg Liquid Aminos are made from health-giving, NON-GMO soybeans and purified water. They are an excellent, healthy, gourmet replacement for Tamari and Soy Sauce. Not fermented or heated and Gluten-Free.Bragg's has a small amount of naturally occurring sodium. No table salt is added. If less sodium is desired use a 6 oz. Bragg's spray bottle and dilute with 1 - 3 distilled water or to taste and then either add in or spray on food.